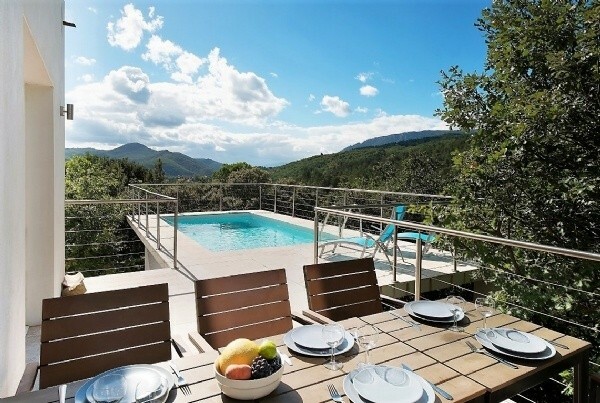 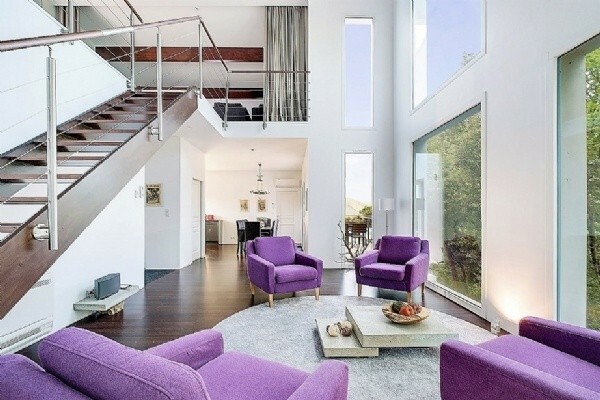 Exceptional contemporary villa (2015) with 168 m2 of living space offering beautiful lounge/dining room/equipped kitchen, 3 bedrooms (one is en suite), 2 bath/washrooms, a living room with a roof terrace, an elevated pool surrounded by terraces and stunning views and an independent room that can be converted into studio on a 1194 m2 plot (not flat) ! 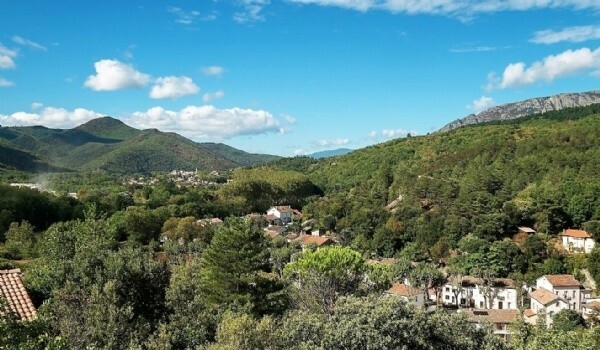 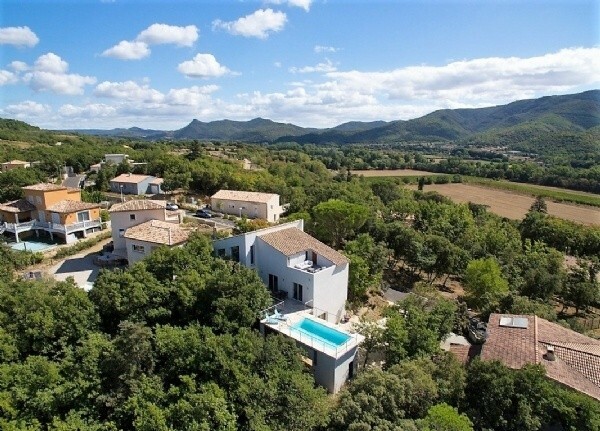 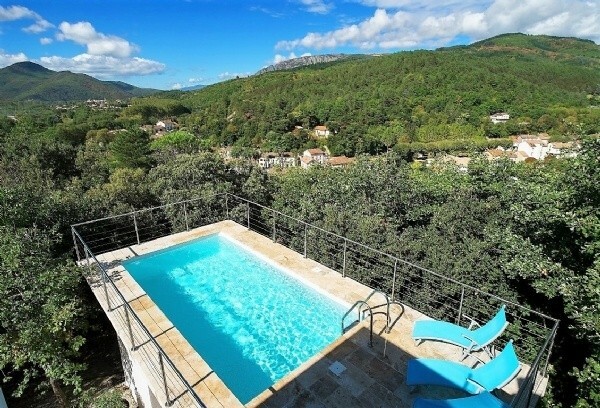 Lively village in the heart of the Natural Park of Haut Languedoc with all shops, bars, restaurants, bakery, supermarket, golf, river: at 10 minutes from Bedarieux and a train station, 35 minutes from Beziers and 50 minutes from the beach ! 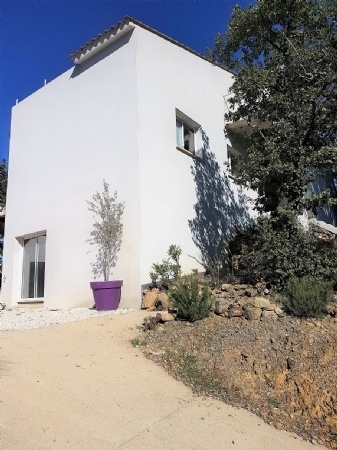 Basement = Studio (to be finished) of 49 m2 (already connected to electricity, water, sewage). 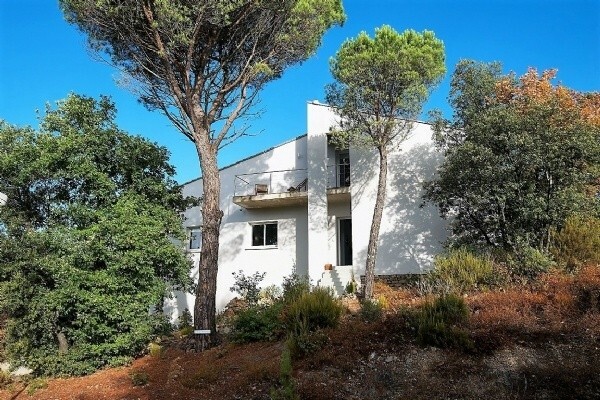 Ground = Hall of 6.61 m2 + bedroom of 16.76 m2 (reversible air conditioning, wooden parquet floor) + washroom of 6.94 m2 (basin unit, WC, walk-in Italian shower) + beautiful lounge/dining room/equipped kitchen of 60 m2 with large french windows giving access to the terrace and pool (wooden floor, reversible air conditioning, fridge/freezer, sink, electric oven, induction hob, hood, built-in dish washer, lower and higher units) + utility room of 4 m2 + bedroom of 12.91 m2 (reversible air conditioning, access to the terrace and pool) with an en suite bathroom of 7 m2 (jacuzzi bath, towel dryer, WC, basin unit, walk-in Italian shower) and a dressing of 2 m2. 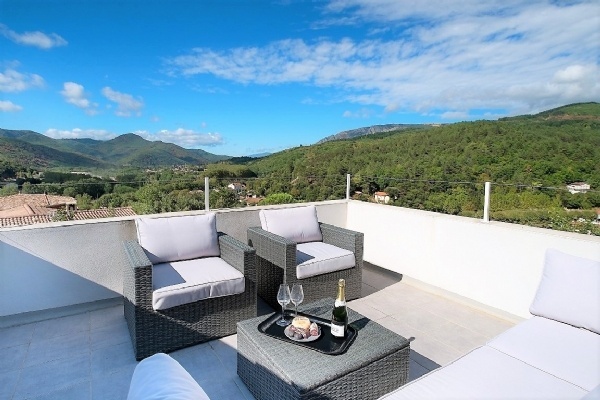 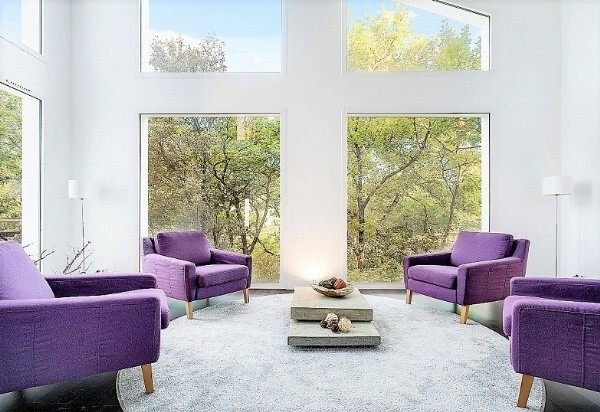 1st = Nice mezzanine living room of 30 m2 with access to a nice roof terrace + bedroom of 20 m2 (reversible air conditioning) with a large walk-in dressing of 5.11 m2 and access to a terrace of 5 m2 + roof terrace of 17 m2 with stunning views on the hills. 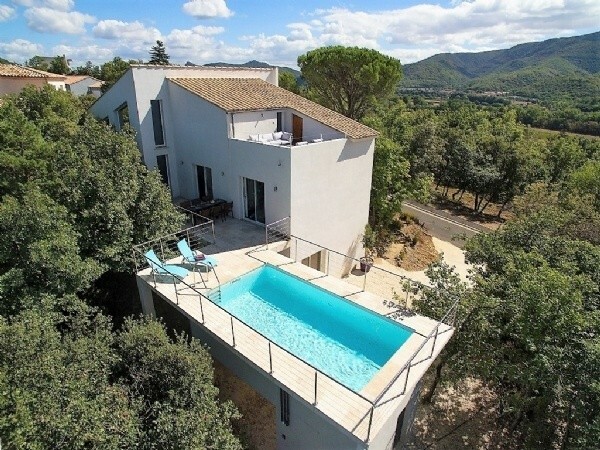 Exterior = Plot of 1194 m2 (not flat) + beautiful elevated pool (6x4m, salted, alarm and mosaic) surrounded by large terrace with barbecue area + roof terrace on 1st of 17 m2 with stunning views + small terrace on bedroom side of 5 m2. 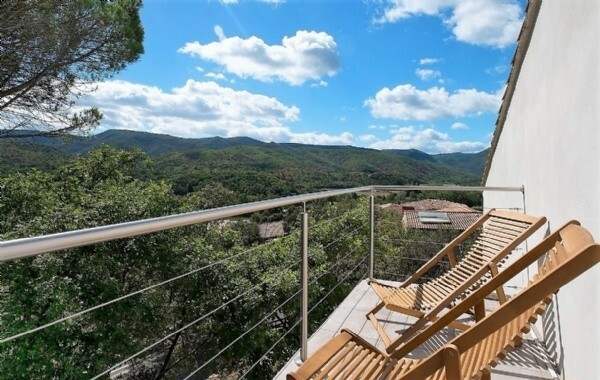 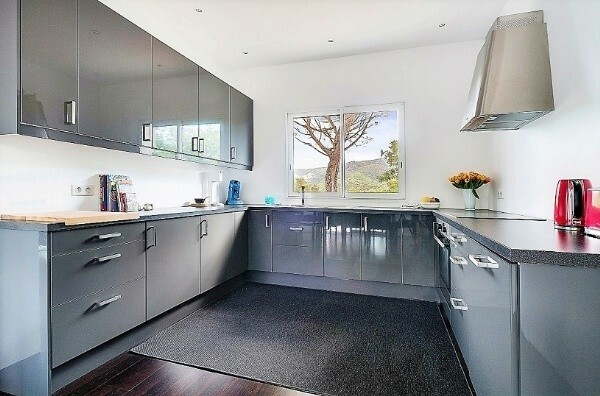 Extras = Peaceful + design + reversible air conditioning throughout + wooden parquet floor + double glazing + built in 2015 (7 years left of warranty) + stunning views + house currently used for seasonal rental with good income (about 19.000 E/year, rented at 2000 E/week in summer) + annual land tax of 1200E.